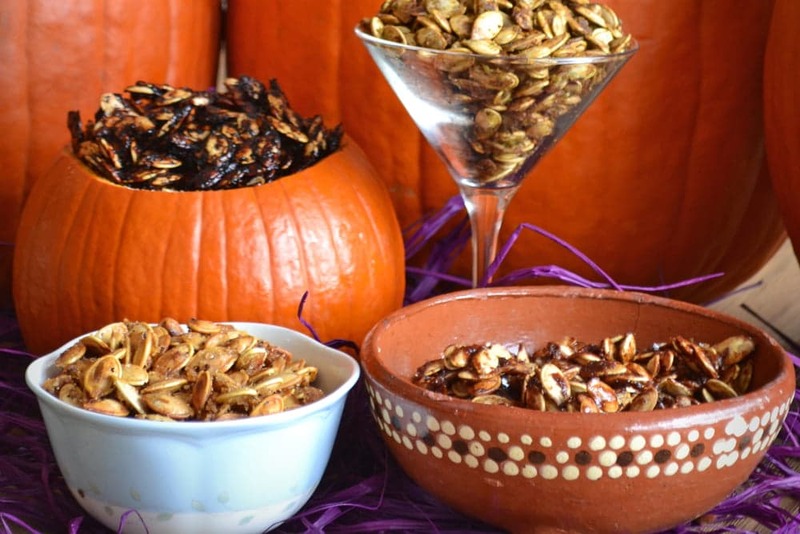 Welcome to my maple pumpkin spice roasted pumpkin seeds recipe. Halloween in just around the corner and I can’t wait to start carving pumpkins while munching on this sweet treat. There have been a lot of traditions in my life but none of them have shown up as regularly as pumpkin seeds. As a kid we always carved pumpkins while munching on pumpkin seeds. This continued through my teen years. 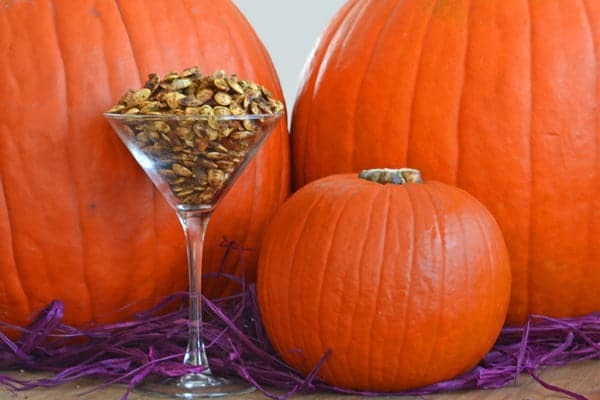 In college I hosted numerous pumpkin-carving parties complete with crazy pumpkin-carving tools, roasted pumpkin seeds and wine (of course there was wine!). Now I find myself in a household where I am the only one who likes pumpkin seeds. Baby M (very soon to be toddler M!) can’t yet eat them, J finds them hard to chew and The Hubs, Brit that he is, never acquired a taste for them at all. And so every year I go about trying to find new ways to doctor them up and show my family just how good they are. This recipe was designed to entice J. 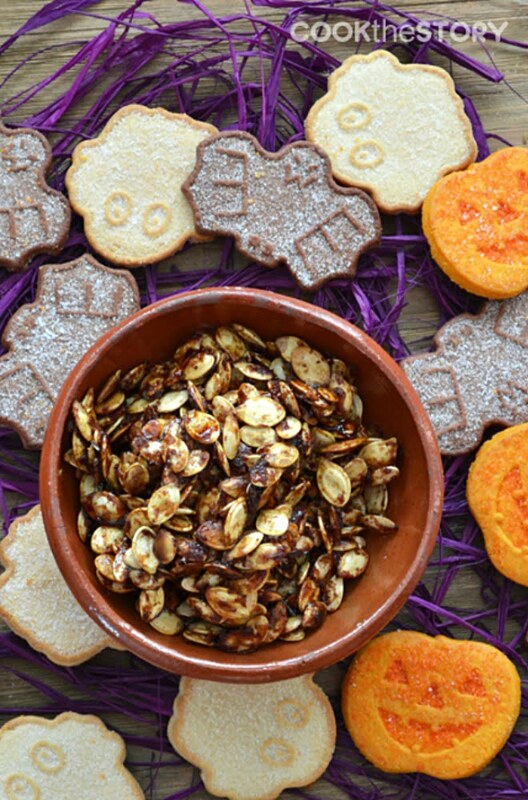 These roasted pumpkin seeds are sweet as can be because of a douse of maple syrup. Plus, they have all those warm comforting pumpkin pie spices that I know he loves. J’s reaction: “Mommy! They’re so sweet and yummy!” Yay! Followed by: “But I can’t chew them. Phhhh!” The phhh was the spitting out part. *sigh* Well, I tried. The upshot is that The Hubs declared them the best roasted pumpkin seeds he’s ever had. And he did eat quite a few. I, addict that I am, ate the rest. 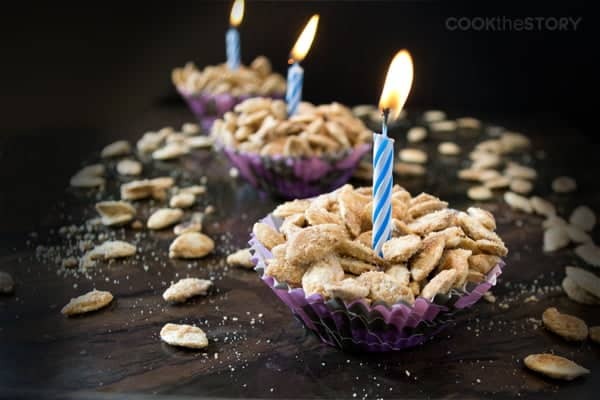 They really are that good (the chewy crunchy texture that my son hates, well, that’s what the seeds are all about, and this recipe is all about the chew and the crunch. I’ll convince him with the next batch for sure). 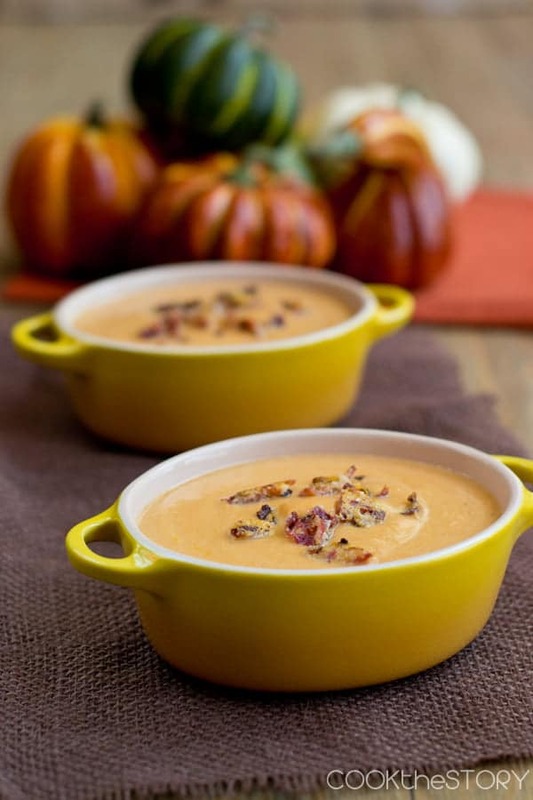 If you love pumpkin as much as I do, be sure to also check out my other seed flavoring recipes and my recipe for pumpkin soup with bacon and Parmesan crumbles. 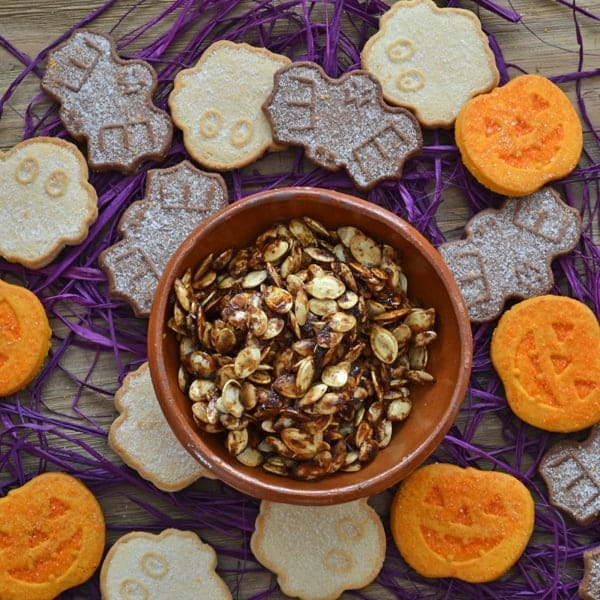 It’s time to make these maple pumpkin spice roasted pumpkin seeds! Pumpkin seeds are roasted with sweet maple syrup and warm pumpkin pie spices in a 2-step process that makes them chewy and delicious. Heat the oil in a large skillet or dutch oven over medium heat. Add the pumpkin seeds. It is inevitable that some water has clung to the seeds so stand back a bit and beware of spattering. Stir the seeds to coat them all with the oil. Cook stirring occasionally until well-browned, about 4-5 minutes. 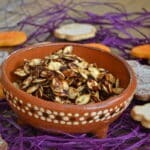 Here’s a nice-looking alternate seasoning for pumpkin seeds worth checking out from Season with Spice. I used to love roasting pumpkin seeds in the fall when I was little (well, my parents were roasting them, not me :)). I haven’t really done it since then, too busy or too lazy at times. I bet maple syrup goes great with pumpkin seeds flavor! Julia, Do give it a try! I bet just the smell of roasting pumpkin seeds will take you back to those times with your parents. Happy Halloween!